Originally published in No 6. 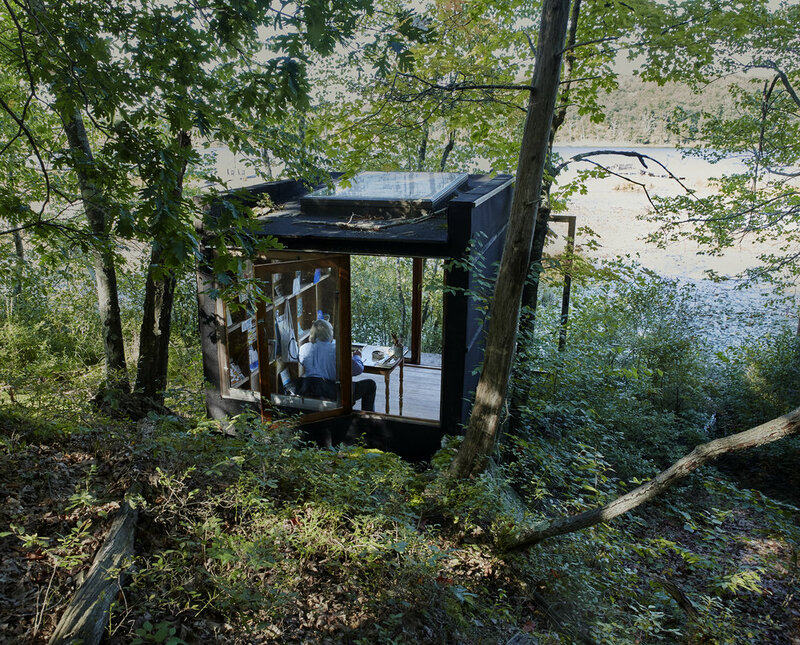 Holl at work in his watercolor hut by the lake. “The summer demands and takes away too much. Holl at work in his studio. Steven, Little Io and and his wife, Dimitra Tsachrelia. That afternoon, in the woods across the road from the property leading down to the lake, I stepped out of a car with a friend and began a hike that almost instantly reestablished the strong connection to nature I formed when growing up in a small town nearby, in Ulster County. All was silence, except for the crunch of our footsteps on leafy groundcover and the echoes of birdcalls in the canopy of old-growth trees. In a way, the experience of hiking there produced the kind of aloneness that lets you feel you can encompass all of humanity — or should at least try harder to do so. ‘T’ Space during the Fall. 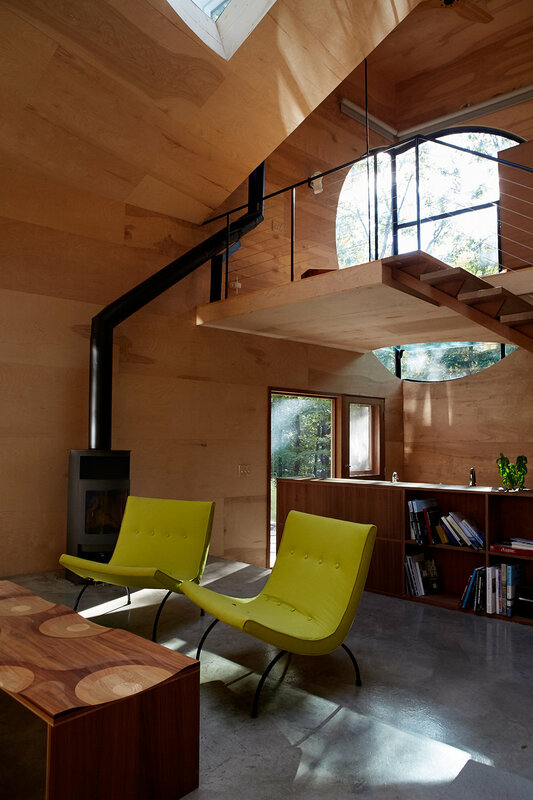 We were at the T2 Reserve, a rocky, 30-acre forested preserve in Rhinebeck, New York, which was recently created by architect Steven Holl, the man from the hut. After several minutes amidst the greenery my friend and I found ourselves delighted by the seductive way in which the path gently reveals itself in front of us, moment to moment. Not with the primal logic of an ancient Indian trail, insinuated centuries ago into the landscape’s dips and rises, like so many other paths in upstate New York. Nor with the Cartesian clarity of a now-abandoned road that was carved out for motor vehicles in the 1920s, still discernible even after new greenery has encroached upon once-clear path. And certainly not with the elegant definitude of a Zen garden walkway, where, with elliptical grace, a string-wrapped stone on the ground might signal, “Not this way, that way.” No, the directional signals to be found in the T2 Reserve reflect the esthetics governing Holl’s architectural work in general: sophisticated but subtle and unpretentious, and all about the rich possibilities any of us can find in the simple experience of being alive — walking through the woods, looking at nature, breathing deeply, gratefully; thinking in a relaxed way about nothing and everything. When I met Holl for the first time, a few days after my hike and peek into his hut, I was eager to tell him what a restorative experience it was for me to visit his preserve — and how much fun it was to discover the path forward. The land from which Holl created the preserve was once slated for subdivision into five suburban residential plots. Holl bought the land and turned it into what he calls an experimental topological landscape. “The last thing we needed here were more McMansions,” he said. It was also a delight, I told him, to come upon the pieces of sculpture he had so cannily placed along the path — discoveries that seemed to draw power from the quiet magnificence of the setting: Chapel of Mosquitoes (2015) by José Oubrerie; SUSTAIN/VISIBILITY (2016) by Dimitra Tsachrelia, Eirini Tsachrelia, and Nicholas Karytinos (1987); and Cold Jacket (2016) by the architect himself, among others. Holl nodded when I said this, having designed this patch of land to express his belief in the close connection between nature and human creation. Also on site are the T2 Studio, an exhibition and working space for participants in Holl’s fellowship program for students and young professionals, and a gem of a residential case study, Holl’s Ex of In house, a 980-square-foot retreat for artists, visitors, and students, which is also now available (mainly through word-of-mouth in architecture and design circles) for Airbnb stays. Holl’s T2 Reserve is an extension of a cultural project that he founded in 2007 called T Space, a minimalist “T”-shaped forest gallery whose purpose is “to unite the architecture, art, poetry, and music of our time.” Holl told me that the impetus for the gallery, the reserve, and the site’s other installations recall the curiosities and creativities that he was feeling even as a child, growing up in Bremerton, Washington. Then, he explained, he and his brother were building tree houses in their back yard and playing a game they called “Property,” in which they were cutting little roads and making little villages in a bank of earth — a kind of real-life SimCity. The house that Holl grew up in was largely hand-built by his father, he added — a man “who was a maker.” By the time Holl entered architecture school, he was an admirer of great humanist philosopher-architects like Alvar Aalto and Louis Kahn — the latter whom hired Holl for his firm but died just before Holl would have begun working there. When I asked Holl how the elements of his architecture conveyed this essentially human spirit, his smile broadened. This aspect of his work is clearly at the core of his professional drive. 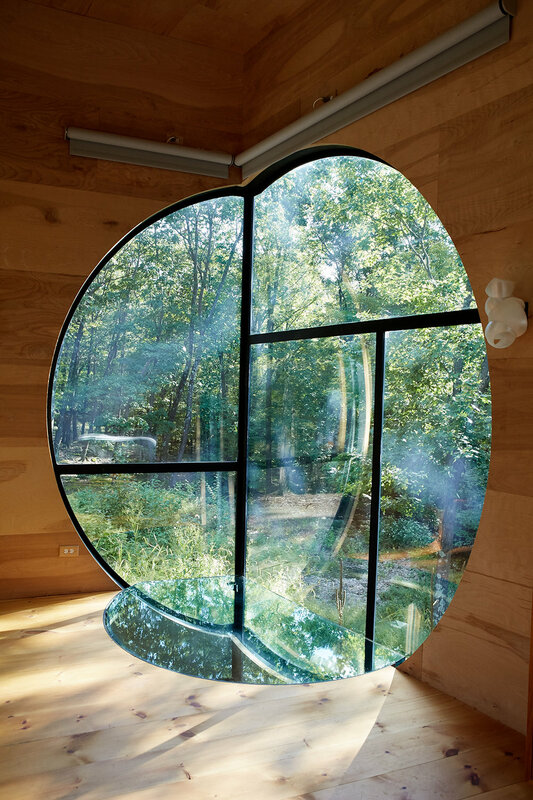 He spoke of form and scale, of course, but also of natural light. Water color study by Holl. Holl’s lakeside hut is a small, wood-frame structure with large windows but no plumbing, heating, or insulation. 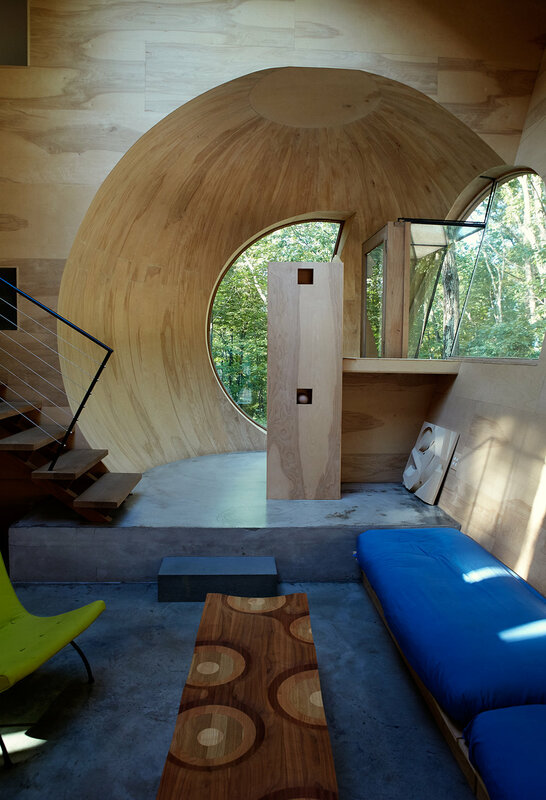 The interior is noiseless but feels tacitly in harmony with surrounding nature — indeed, that is its chief function. Those eloquent, swiftly made watercolors that grace the wall inside represent a wealth of thought, observation, existential interrogation, and esthetic investigation. Unsurprisingly, Holl’s working environment, an expansive office floor in New York’s West 30s, is a correlative of this hut — only populated by the 40-some professionals of his busy architectural firm. In a former industrial building, towering windows admit a wash of light; an atmosphere of charged quiet prevails. In front of computer screens the firm’s designers concentrate on projects ranging from a library in Malawi to a major expansion of the John F. Kennedy Center for the Performing Arts in Washington, D.C. Elsewhere in the office, 3D architectural studies and models are printed. 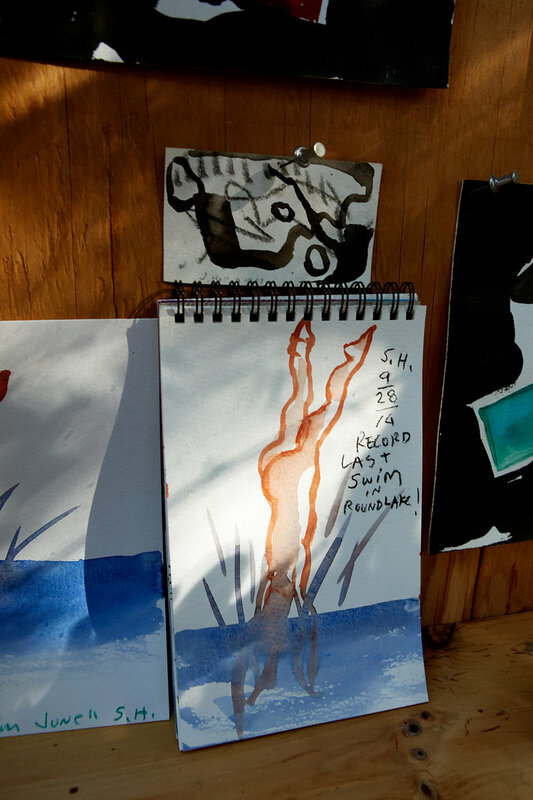 In Holl’s private office, some of the 30,000 watercolors he has made over the years are at hand, in folders and notebooks, many out and available for contemplation and inspiration. On a table sits the shell of a lighting fixture that the architect designed for his Ex of In house — a white, scalloped object that looks like it might have been modeled on the four chambers of the human heart. Holl’s homage to late poet John Ashbury. Strolling down a forested country road and coming upon the Ex of In house — a decorous composition of geometry that barely contains its boisterous energy — is a thrill: Culture complementing Nature. And the public is invited to experience this for themselves. Past programming has featured poet Ann Lauterbach, artist Pat Steir, and musician Don Byron. Entering Holl’s world means more than embracing Nature with a capital N. It means giving yourself back to your own human nature apart from screens and media and a frame of mind often too distracted — actually, too constricting — to allow the deepest kind of breathing that human bodies are capable of. Stephen Greco wrote the live shows Inside Risk: Shadows of Medellin and Peter and the Wolf in Hollywood. His most recent novel is Now and Yesterday published by Kensington.